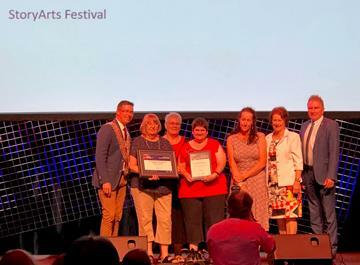 StoryArts Festival Ipswich was given a highly commended award in the recent Ipswich City Council Australia Day Awards for Citywide Event of the Year. On stage are Mayor Andrew Antoniollo, Jenny Stubbs, Robyn Robertson, Karen Stokes, Roz Reichle, Councillors Sheila Ireland and David Morrison. The IDTL Network is very proud of this recognition having organsied a a free festival for chidlren every two years since 1995 with thousands of people attending each festival.